Epic doesn't include violence for the sake of it, says design director Cliff Bleszinski. Bleszinski has stuck up for violence in videogames, or at least in the Gears of War videogames anyway, saying that it's too over-the-top to be offensive. Speaking to the BBC's World Service, Bleszinski said that Epic included the violence to make the experience better, not because it got thrills at the sight of blood. 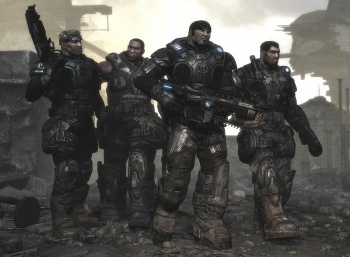 Bleszinski said that the sort of violence that you might find in the Gears games was on a par with the slapstick, humorous violence of the old Looney Tunes cartoons, and not something that anyone should be taking seriously. He thought that most people's reactions when they saw a "muscular space marine beating down a lizard man," would be to "smile and giggle," rather than get offended. He said that Epic kept a tight watch on how far it went in its games, to make sure that it never crossed the line. Epic didn't include the violence for its own sake, he explained, it was included to make it very clear to players when they were successfully hitting their targets. That kind of feedback was vital to making an interactive experience, he added. "We're not depicting a guy in Downtown Los Angeles pulling a truck driver out of his car and hitting him over the head with a brick," he said. "That's not who we are." It's certainly true that Epic has steered clear of realistic depictions of violence in Gears of War; it's got a heck of a lot more in common with horror movies than it does real life. Similarly, Bleszinski's suggestion that it provides feedback to the player makes a lot of sense. It seems unlikely however, that that distinction is going to matter those opposed to violent games; the question of why you're dicing aliens up with a chainsaw will probably be less important than the fact you're doing it in the first place.